Tonight: Rain develops. Low in the mid 40s. Monday: Damp, raw. Early rain. Afternoon showers. Highs in the low 50s. Tuesday: Showers, perhaps a few wet snowflakes inland. Mostly cloudy. Highs in the low 50s. CAPE FORECAST Tonight: Mostly cloudy. Low in the mid 40s. Monday: Damp, raw. Early rain. Afternoon showers. Highs in the low 50s. Tuesday: Showers, perhaps a few wet snowflakes inland. Mostly cloudy. Highs around 50. It was another warm day across the majority of New England. Skies were cloudier than they were on Saturday. The clouds are signalling an approaching storm system. Overnight showers will develop. 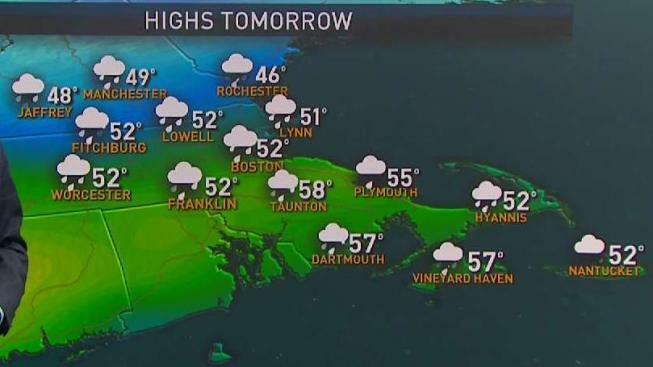 Showers will transition to a period of steady rain in central and southern New England. In far northern New England, from the White Mountains into the crown of Maine, significant snow is likely. Snowfall totals may approach a foot in spots. Another round of unsettled weather is possible to close out the work week. Showers will be around Friday. The weekend looks mostly dry, but we can’t rule out a few remaining showers. Unfortunately rain chances increase once again going into Marathon Monday. It’s still a week away and the forecast will likely change a bit, but the current thinking is that it will be rainy and raw. My Tuesday and Wednesday of the following week, the sun should return with temperatures holding in the low 50s.